Sulfur needs to mineralize into sulfate to be taken up by the plant. This process is contingent on the microbial breakdown of organic matter. Cool and wet soils will slow mineralization and increase the need for sulfur in sensitive crops, even in situations where soil organic matter is greater than 4.0%. 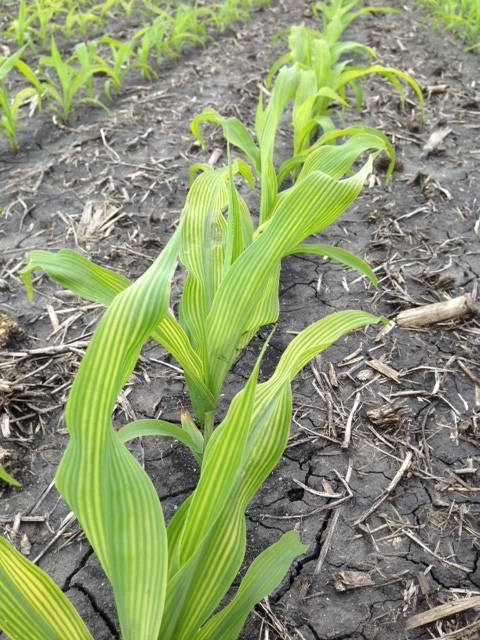 Poorly drained soils also can show signs of sulfur deficiency early in the growing season. Application of as little as 10 pounds of sulfur per acre can go a long way to alleviating sulfur deficiency early in the growing season. Recent research shows that the corn plant takes up roughly 10 percent of sulfur by the V6 growth stage, 50 percent between V6 and silking and 40 percent from silking until crop maturity. The plant only needs a small amount of sulfur early in the growing season, but this time period is still critical. Early season is when sulfur availability is most commonly low and is a critical time for maintaining available sulfur in soil. Sulfur can be applied to corn through V5-V6 without yield penalty even if deficiency symptoms are present. Earlier application is better to ensure enough sulfate sulfur is available to the crop during peak demand, which starts around the V6 growth stage. Two sources of sulfur are commonly available for application. Sulfate sulfur sources like ammonium-, potassium-, or calcium sulfate contain sulfur in readily available forms. Elemental sulfur must be made available to plant by a process called oxidation which is completed by soil microbes. Oxidation is slow at cool temperatures and may not happen until late in the growing season. It’s also affected by the size of the elemental sulfur particle applied to the soil. Apply sulfate sulfur with elemental sulfur to ensure some sulfate is readily available for crops. Liquid thiosulfate products have been shown to supply sulfur to crops but remember that half of the sulfur in thiosulfate is in the elemental form and half is sulfate. Targeting the right product depends on many factors but can go a long way to ensure you are getting the most out of your investment in sulfur fertilizer.